Himalayan views:Everest, Lotche, Makalu and Kanchanjunga. Makalu Base camp Trekking is an adventours journey to the Makalu Base Camp (5250m) with rewards of majestic views of Makalu, the fifth highest mountain in the world. Makalu is still a remote, unexplored and pristine areas of the Himalayas that have all the magic and myth to keep many a traveler under its spell. 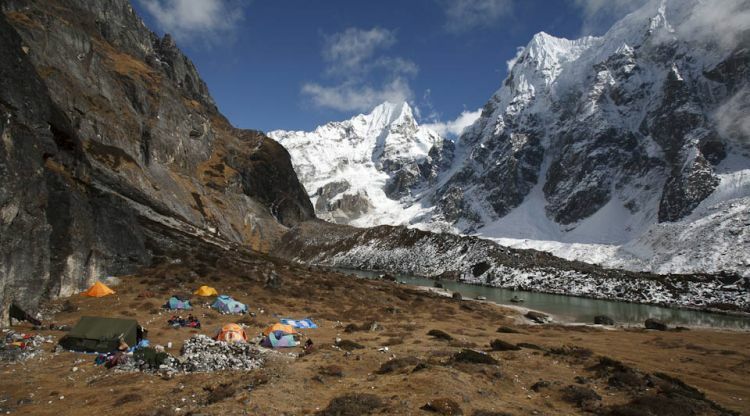 Makalu Trek is a truly intrepid expedition to a remote and wild region of the Great Himalayas. The Makalu Trek route traverses lesser known trekking trails of Nepal and comes head to head with three high mountain passes: Sherpani Col (6135m), West Col (6143m) and Amphu Laptsa (5850m). We will also reach Makalu Base Camp (5000m) which offers superb and spectacular views of Everest (8,850m), Kanchanjunga (8586m), Lhotse (8,516m), Makalu (8,463m), Chamlang (7,319m) and Baruntse (7,220m) among others. The inhabitants of this region are of Tibetan ancestry and this fact is clearly evident in their attire, speech and customs. We will be able to learn more about their Buddhist culture by interacting with them and visiting Buddhist monasteries and chortens in the region. The trekking trail runs along Makalu-Barun National Park, one of the newest and well preserved national parks in Nepal. The park is home to an amazing 3000 species of flowering plants, 440 species of birds, and 75 species of mammals, including the Snow Leopard, Red Panda, Musk Deer, Wild Boar, Wild Yak and Himalayan Thar. Trekkers will enjoy climbing hills, crossing rivers and appreciating the beauty of one of the remotest corners of the Himalayas. This trekking is a challenging trek only suitable who are physically fit and mentally prepared to trek to highest reaches of the Himalayas. Please note there are very few and no facilities of lodges in this region. One of the the highest passes called Shipton La (4216m) is a high note of this trek. Other similar high passes we will have to cross over include Keke La(4150m), Ghungru La (4050m). Overall we will be gaining of altitude of 4000m! The pass provides spectacular views of Mt. Makalu, Mt. Jaljale and Mt. Chhamlang among others before finally descending down to the mysterious Barun Valley. The area is unique in biodiversity and is the flower kingdom of Nepal. There are over 3000 species of flowering plants, including varied species orchids and rhododendrons, recorded in the Makalu Barun Park. The villages are a mix of Sherpa and Rai communeities whose staple diet includes rice, corn and buckwheat. Trekking in this region is best during Spring (March-May) and Autumn (Sept-Nov) seasons.